Leftist protesters demonstrate at Petah Tikva synagogue, disturbing Attorney General Mandelblit's recital of the mourner's prayer. Lefitst protesters on Saturday night disturbed services at the Petah Tikva synagogue where Attorney General Avichai Mandelblit was praying. Shouting, the protesters disturbed Mandelblit's recital of the Mourner's Kaddish (mourner's prayer) in memory of his mother, who passed away two weeks ago. The prayer is said three times a day for amost a year after the loss of a parent. Mandelblit was removed from the scene and escorted home by a security guard. Justice Minister Ayelet Shaked (Jewish Home) said, "Unfortunately, I see it is necessary to explain, so here is a rule of thumb for those protesting in Petah Tikva: When you discover that in the name of free speech, you are preventing a Jew from saying Kaddish for his mother - that is not democracy anymore. It is violent bullying." Opposition leader Yitzhak Herzog (Zionist Union) said, "It is shocking to see how these protesters are so dense and lacking in sensitivity. They disturbed the Attorney General when he was praying in synagogue, saying Kaddish for his mother. This is an inhuman act. There is a limit to the freedom of Israeli democracy's holy protests, and these lines should not be crossed." Likud MK Nava Boker said, "This evening, a shameful act was perpetrated, and red lines were crossed. After guillotines, racist comments, and calls of 'Death to Zionists,' we have reached a low point: Leftist protesters arrived at a Petah Tikva synagogue and prevented Avichai Mandelblit from reciting Kaddish for his deceased mother." "This is no less than a serious insult to a person's basic right to religious freedom. I am shocked by this atrocious act, and I hope that my colleagues in the opposition will rush to condemn this incident." 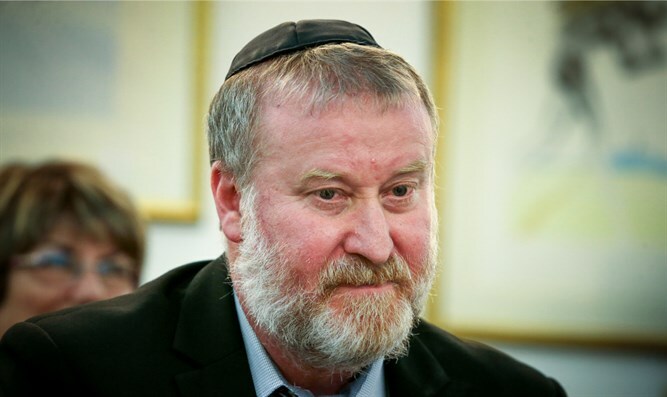 Knesset speaker Yuli Edelstein (Likud) said, "The persecution of Attorney General Mandelblit, while he recited Kaddish for his deceased mother, crosses every line. The barbaric and violent act which we were witness to as the Sabbath ended is completely and totally unacceptable! I call on the protesters to put an end to indecencies such as this one, by exercising self-restraint and using [proper] judgment and sensitivity."